Thread: Place your votes here!! 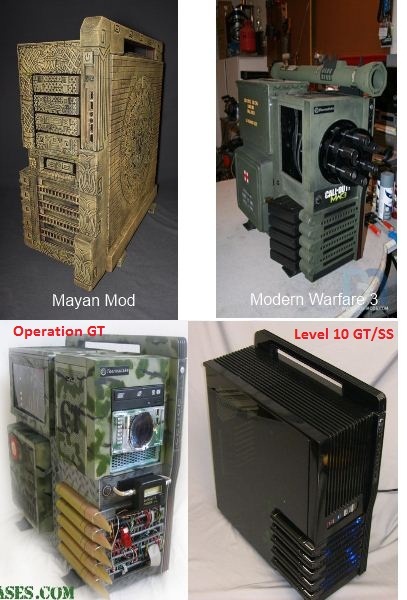 Here we go we have the final four mods to vote upon for the AWESOME Thermaltake Level 10 GT mod contest! Thermaltake is such a great supporter for our community and we can not thank them enough, but with your help I know we can! Spread the word about them to all your friends everywhere! OK, here we go. The image below will help you pick out the winner, but PLEASE go to the worklogs for each mod so that you can really get all the details that went into creating these master pieces of modding! Use the poll above to cast your vote and please lets keep this thread to voting only, thanks. All 4 are beautiful works of art, good luck and many blessings to each participant! Good luck everyone on some STELLAR building here! It's a pleasure modding with you. MW3 is sick but the Mayan one is just.... amazing artwork.